Today is day 14 of the Creative Christmas Countdown which means I get to share with you a wonderful activity you can do with your family during advent! Welcome to all you coming over from Creative with Kids, I hope you take some time to look around Art For Little Hands and see all the other wonderful activities we do in our home. 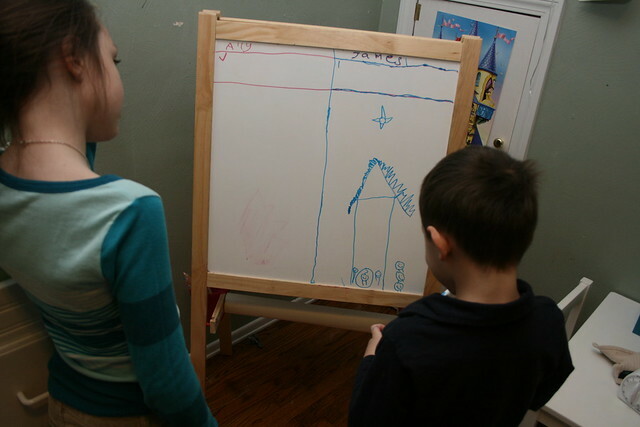 You don't need a pictionary game to play pictionary anytime. In fact with little ones I find it better to play without the gameboard and really without scoring at all. To play all you need to do is think up a bunch of words you think would be fun for your children to draw. I simply took the children out into the hallway and whispered the word, but if your children are old enough to read you can write them out on pieces of paper. 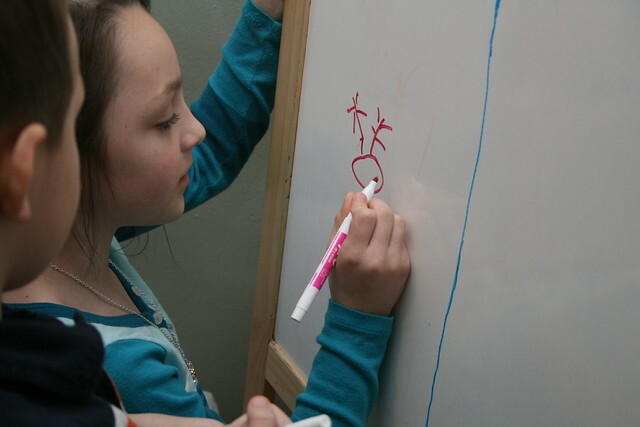 Each child takes a turn drawing a word that only he or she sees and then the family tries to guess what the word is that he or she is drawing. If your family is large enough you can split into teams and take score. It was only me and my two older children playing so we didn't keep score. To play a timed drawing game you need drawing materals, a minute timer, and two or more people. So easy. 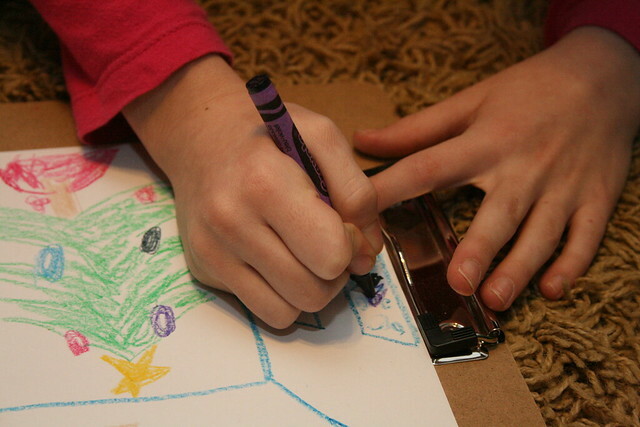 What you do is have each member of the family draw a picture of the same thing and then compare drawings. I played with just my daughter and in the end she said, that was so much fun! I would really like to do this with everyone in the family just haven't had my husband around enough. I think the kids would get a kick out of their dad playing this with them. 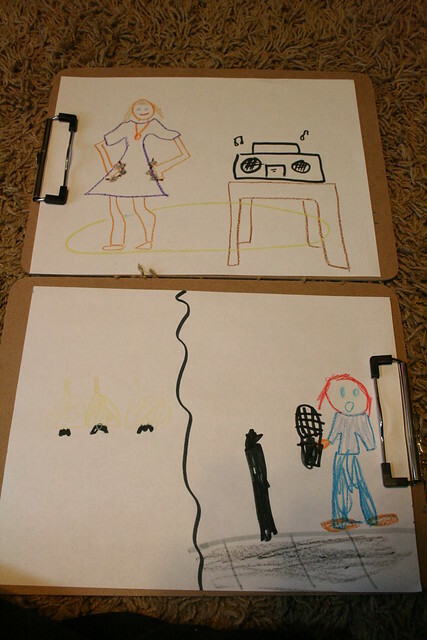 For this game it is also fun to have song titles for the pictures to draw and even to sing the songs as you draw. mine: Top, Ally: Bottom -- can you guess the song? This is a game I play often with my son when we are at church or waiting somewhere. Each person takes a turn drawing one thing to make a whole picture. You go back and forth until the picture seems done. This is also a fun one to do with toddlers. My eldest and me also enjoy doing this in mandala form each taking a turn making the next layer of the mandala. 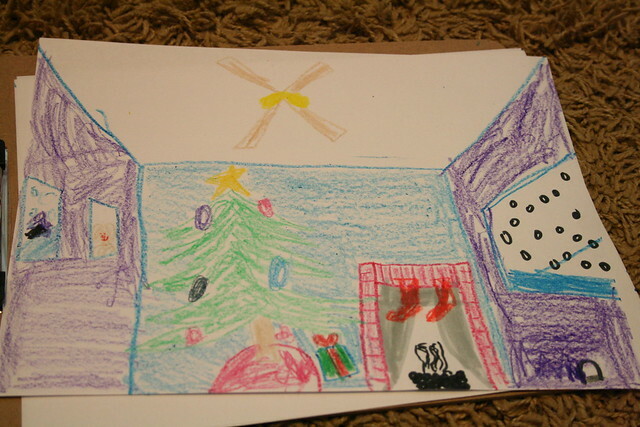 To give this a theme you can make a rule that each part of the drawing has to go with the theme of Christmas, or whatever theme you chose. 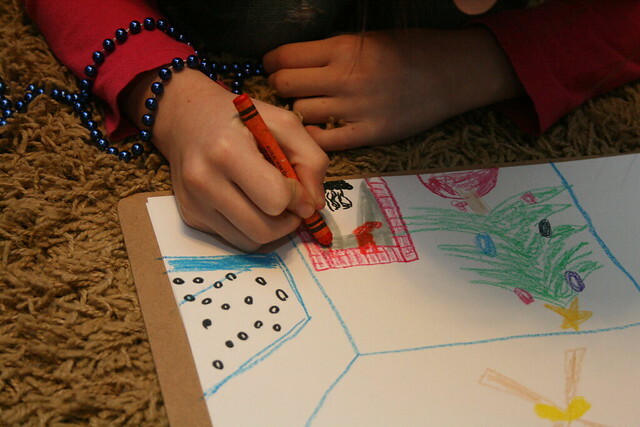 This activity is really good to do with a child that doesn't ever particularly want to fill in all the space on their paper or go into much detail. Also works with toddlers, just don't expect them to want to keep going always. 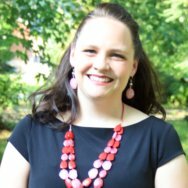 My toddler lasted about 2 passes. 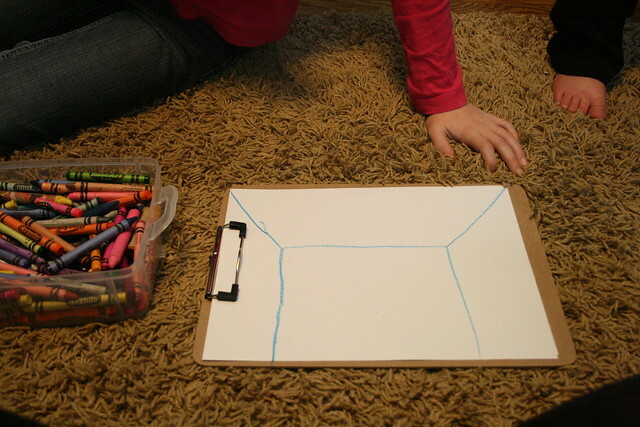 For this activity it is good to draw a room to start with, but not necessary. Lots to fill up in a room. my rule is one thing to draw each time. I say only one color, but my kids hate that and never obey the rule. Our finished picture done together. I love the little mouse hole my daughter drew on the left wall! 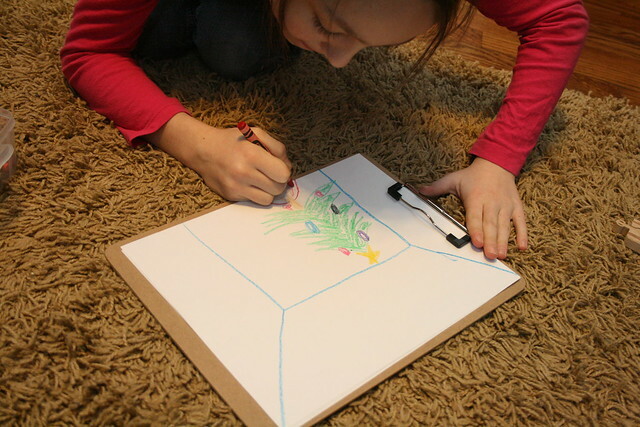 Now you are off to do a drawing game with your little ones. Takes only a few minutes and is sure to delight. Or remember paper and crayons to carry in your purse for those emergency "need to entertain a little one moment" all parents have. If you haven't had a chance be sure to check out day 1-13 of the Creative Christmas Countdown and keep following along. Lots of good ideas have been shared already such as holiday book advent, Homemade Christmas cards, walnut baby ornaments, Handmade Thank you cards, Sing a Song, Fun with Grandparents, Hot Cocoa Party, Paper Trees, Gingerbread houses, handmade bird feeders, peppermint play dough, decorate kids rooms for the holidays, and handmade gift wrap. I can't wait to see the last 10 activities. i love the past the picture! what a fun idea! 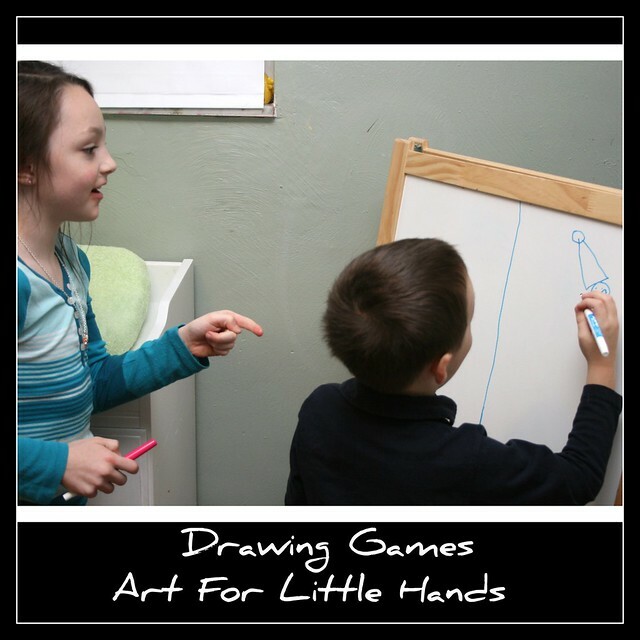 What brilliant and unique ideas to convert drawing/art into games and play! What a lovely way to enjoy the holidays. I'll bookmark this post and check out each idea in detail so we can play these games too. Recently, for my daughter's birthday party, we had a similar theme - artful games. We did an art medley, played timed drawing with music in the backdrop and such. I love these ideas! I will definitely be trying them with my girls. AND it'll be fun to play these when my company comes for the holidays! fabulous ideas! Love pass the picture..totally doing this one tonight! Thanks! I l,ove your games, sadly we haven't done many drawing games around here. Thanks for the great pictures and ideas. Thanks for the great ideas! I am excited to try playing a Christmas themed pictionary game. We play pass the drawing here too and it's always a hit. I can see using these at so many different times - not just for the holiday. I am always trying to collect ideas for things children can do in pairs - I think that one on one time is so valuable for preschoolers to learn about working together, and these are games the children can do independently after working with an adult the first few times. Great community building, I think! Good idea to build a template and have them fill in the rest- and I like the word correlation exercise you describe above!